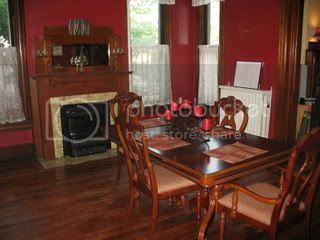 I'm trying to sell my house, and it's starting to stress me out. You see, my husband and I bought this house, our first, in September 2001. We weren't really looking for a house to buy; we just happened to see this one for sale by owner and decided to take a look. We were immediately in love with it. 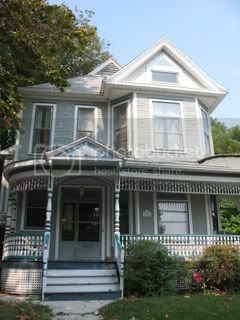 It's a 100-year-old Victorian with stunning woodwork, tall ceilings, pocket doors, fireplaces, and loads of character. With over 3000 square feet, it was much too large for us, but we spread out and settled in. Over the 5 years that we lived here together, we tore out carpet, painted rooms, installed new lighting fixtures, remodeled a bathroom, reworked the backyard, and started finishing the attic. It was a labor of love. In the summer of 2006, hubby decided he wanted to look at new houses. I was hesitant, for a variety of reasons...one of which is that the house needed some work on the front porch. I was worried about it not selling with a porch that was literally falling down. Nevertheless, I agreed to look at houses and we eventually made an offer on one, a much newer & more expensive one. I was still hesitant and nervous about buying a new house before selling the current one, but hubby convinced me it would all work out. It didn't work out. A few months after we moved into the new house, I moved back into the old one...where I've been ever since. I am still trying to sell it, and I am to the point of utter frustration...not because it isn't selling, but because I am tired of the comments people are making about it. I KNOW the porch needs to be fixed! I KNOW the outside needs painting! I KNOW the wood floors aren't refinished! I KNOW all this, yet people keep pointing it out to me...as if I can't see those things myself. If I could afford the repairs, I would do them in a heartbeat and stay here. I love this house. It's my home...the only "real" home I've had as an adult. Why can't people see that? Why do they insist on attacking it so harshly? It's not unlivable...far from it...it just needs a bit of TLC. But, I can't afford all that work on my own and that's why I'm selling it. It's such a personal thing to sell a house. I am taking all the comments too personally, I know, but I've tried my hardest to make this into a comfortable home...especially now that I am back here, in different circumstances, with half of the furniture I used to have and with all the memories of another life here. And hearing about all the stuff that's wrong with it only makes me feel worse. Anyway...for the agent open house today I made raspberry-almond blondies, a Martha Stewart recipe I adapted slightly, and they made me feel a little bit better! 9 tablespoons unsalted butter, softened (plus more for pan). 1 2/3 cups all-purpose flour. 1 cup light brown sugar. 1 cup sliced almonds, toasted. 1 small container of raspberries. Preheat oven to 325 degrees. Line a buttered square baking pan with parchment paper (or foil), allowing 2 inches to hang over sides. Butter lining (excluding overhang) as well. Martha suggests an 8-inch pan, but I used a 9-inch stoneware baking pan. Whisk together flour, baking powder, and salt in a medium bowl, and set aside. Put butter and sugar in the bowl of an electric mixer fitted with the paddle attachment; cream on medium speed until pale and fluffy, about 3 minutes. Add eggs and vanilla; beat until combined. Add flour mixture, and beat on low speed, scraping down sides of bowl, until well incorporated. Mix 1/4 cup almonds into batter. Pour batter into prepared pan; spread with buttered hands (or a rubber spatula). The batter is very thick, almost like cookie batter. Don't be alarmed. Scatter berries and remaining 1/4 cup nuts over batter in pan. 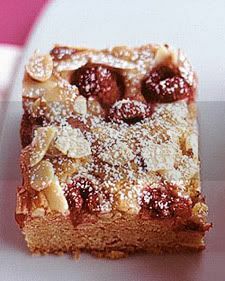 Bake until a cake tester inserted into blondies (avoid center and edges) comes out with a few crumbs but is not wet. According to Martha, bake 55 to 60 minutes in an 8-inch pan, but I only needed 35-40 minutes for mine. Let cook a few minutes in pan before using parchment to remove the blondies to a wire rack. Cool completely, then dust with powdered sugar before cutting into squares. These are really good, something I will definitely make again. I think they make a nice Valentine's treat as well! Kelly -- I LOVE your house! If you can, I would try and hang on to it. Believe me, I know that remodeling can be expensive -- and stressful! (We just did a similar remodel as you on the house we just sold). But if you do keep trying to sell, I can't imagine why someone wouldn't fall in love with the place! It's so CUTE! I tried the flourless cake you posted and mine was OK (a little dry). I need to learn to measure. I don't think I have enough experience to eyeball yet! I am hoping to try the panini sandwich you posted the other day as soon as I talk Jim (hubby) into buying me one of those pans (like yours). I love reading your reciepes though, even if I am not brave enough to make them yet. When I get a chance, I'd love to try the Grandma's Mac and Cheese that you mentioned a few months ago. That sounds so yummy right now! Thanks for checking out our new place. I am excited about the new kitchen too! It looks much better in person and maybe once I am up to actually cooking food that people want to eat, then we can talk you into stopping by for dinner! I really do love your house! If we weren't so totally embedded in Webster Groves, we'd snap it up in a second! Good luck with finding a buyer who will love it as much as you do. I linked to your blog through Rachel G's blog. I absolutely love your house and actually have had a similar experience with two homes. My hubby and I bought a 100 year old bungalow in St. Joseph, MO. We wished we could float it down the Missouri River and plop it down on the banks in St. Charles, MO. Unfortunately, we lost all our equity just to sell. 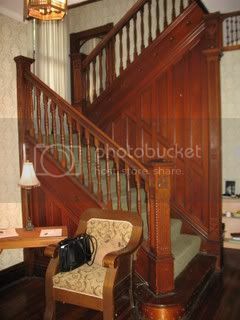 When I was a girl, I helped my parents renovate a 100 year old stagecoach inn. Doing the work is so creatively fulfilling. Is there any way you could get a historical renovation grant? I love your house, too. Of course it's wonderful. I think people who are looking at houses point out every flaw in order to try to get the price down. I know I am guilty of this. They, we, think that if we go around ooing and awing the seller/agent will thing we're a fish and keep the price up real high. So, you know, I guess that's the name of the game. It's hard, 'cause what's more personal than a house? And what's more expensive? Not much. Was planning on a more substantial recipe for T&C VI, but ran out of time (I'll be out the rest of the week), so I made these blondies. We enjoyed them! Speaking as one of a dozen or so agents who enjoyed your home and your blondies, we loved them both! Really! Copyright 2007-2013. All rights reserved. Simple theme. Powered by Blogger.